Harvest nightbloom vine from the Echoing Hollow. 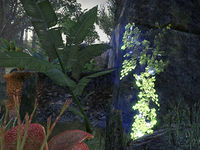 Gather some nightbloom vine from the surrounding area and within the ruins. Talk to Bolu to receive this daily quest. "I declare truth. While the Naga-Kur is the strongest tribe in all Murkmire, we still request aid every now and then." "Go to the Echoing Hollow, far across the land. In that secluded bog, the rare nightbloom vine grows like weeds. Gather nightblooms and bring them here. Beware the guardian of the Hollow, though. It dislikes intruders." "One of Murkmire's miregaunts. It's a huge, lumbering creature we call Walks-Like-Thunder. Very strong. Very dangerous. Best to kill it before you try to gather the vines." I'll gather nightbloom vines and kill the guardian of the Hollow. Head east of Dead-Water Village to Echoing Hollow. The nightbloom vines are located around the world boss and inside the ruins within the Hollow. Defeat the Miregaunt. The guardian has around 2.5 million health. Be sure to watch out for the Totems it summons, which fling hist sap at the players engaging the miregaunt and will heal the boss if they are left up too long. Take down the Totems. It is recommended that you assign the task of taking down totems to a ranged dps, someone with a bow or a destruction staff will do. If you are rooted by the miregaunt's cone-shaped root attack, roll dodge out to break free. Avoid the area of effect abilities the boss deals out, and make sure to take down the totems. The healing those totems give the boss is massive. One failure to take down most or all of the spawned totems can bring this boss back to near-full health. As long as the totems are being burned down consistently, this world boss is easy. Once the boss is dead, the best opportunity to collect the nightbloom vines presents itself. Collect the vines around the boss area and inside the nearby ruins. With the boss dead and the flower vines in hand, return to Bolu in Lilmoth for your reward. "You look like the wamasu that caught the dragonfly. Was your hunt successful?" I killed the guardian of the Hollow and collected the nightbloom vines. "I speak truth. I expected the miregaunt to break your bones and leave your body to sink into the swamp. A pleasant surprise that you survived. And that you succeeded. The Naga-Kur thank you for your service." I should go to the Echoing Hollow to gather nightbloom vines for Bolu. While I'm there, I should also kill the Hollow's guardian, Walks-Like-Thunder. Finishes quest I gathered nightbloom vines and killed Walks-Like-Thunder. I should return to Bolu and claim my reward. This page was last modified on 28 December 2018, at 22:52.